Is your solar panel installation MCS compliant? Because the placement of a PV system on a roof is a structural alteration MCS states that the roof has to be structurally sound. One of the biggest problems is that a lot of installations do not have a structural report due to an oversight by the installer. This can impact on insurance and building control. 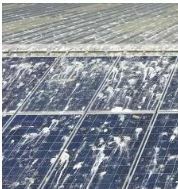 Bird droppings are a huge problem for solar panel owners in Scotland. Solar panels offer birds an easy nesting site. Solar Services Scotland provide a professional bird protection, proofing and service for residential and commercial solar panel installations. Bird / Pigeon control is important due to the damage and disease problems these problem birds often create. The uric acid in pigeon faeces is highly corrosive and can cause extensive damage to metals and other substrates they sit on for long periods. Cleaning bird droppings on your solar panels important because they create what is known as “hard shading.” This is when a solid object blocks sunlight in a clear definable shape. This can be detrimental and damage your solar panels because the current cannot flow through these shaded areas and is diverted to non-shaded areas. Over time this can cause “Hotspots” and lead to a temperature increase. This affects the efficiency of your solar panels. Contact Solar Services Scotland to discuss our solar panel bird proofing & protection services.